One of the most popular fish species, Betta fish are highly admired and bred by fish aficionados as well as beginner hobbyists. These are liked because of their multi-colored bodies and enticing fin shapes. If you are a proud owner of this fish, you should take special care of the fish. Providing nutritious food to your Betta fish is quite important for the healthy growth of these fish. At Pets World, we provide a premium range of optimum quality Betta fish food. These food products are procured from the leading brands in this domain such as Drools, Hikari, Toya and, AquaPharm. 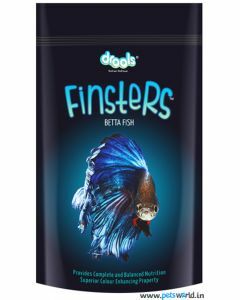 We provide this fish food at highly discounted prices and in different quantities to meet varied demands of the customers. You can order them in the comfort of your home and we will make sure that the goods are delivered to you, within a fixed time frame, at your doorstep. span> , we also provide free delivery all over India.